For some, it’s useful to go to OneRiot to search for links being tweeted or dugg in real-time. But for a lot of people it’s better if the sites and services they’re already using have the functionality built-in. That’s OneRiot’s intention in opening up its API to the public today. The site’s API, which has been in use with selected partners for several weeks, will give third-party developers a chance to bake the results right into their sites or apps. One of the big developers that has already been using it is Microsoft, which has a version of its web browser, IE 8, with OneRiot built-in. 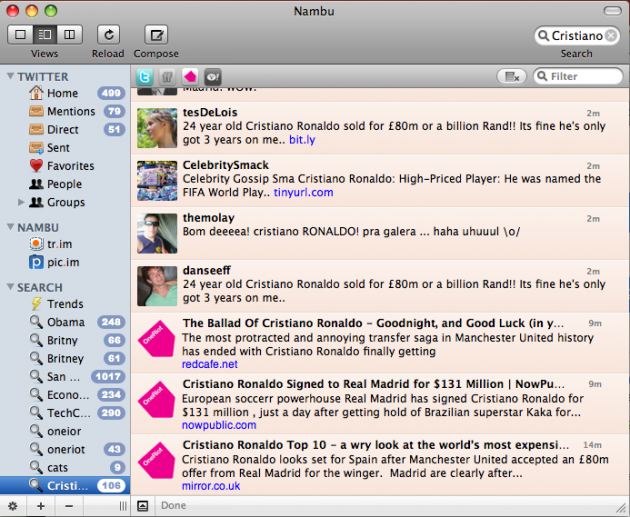 Another partner that has been using the API is the desktop social messaging client Nambu. You can imagine that a lot of the clients that offer Twitter functionality may also want to offer real-time link search capabilities, which OneRiot’s API will be perfect for. Realtime Search Results – a realtime stream of related web pages and videos that the social web is buzzing about right now for any search query. PulseRank Search Results – a feed of search results ordered by relevance using OneRiot’s PulseRank algorithm, PageRank for the realtime web. OneRiot Trending Topics – a feed of emerging topics heating up across the web right now. Simple Web Search Interface – allowing developers to provide innovative search integration with minimal investment. OneRiot CEO, Kimbal Musk, will be participating in our Real-Time Stream CrunchUp this Friday.